Everyone is looking for that immaculate looking lawn. Lawnmowers for making stripes are the perfect garden tool for this job. We all envy those places with the best lawn mower for making stripes for they have a perfect finish. Whether you just want to cut the grass or you are an avid gardener, the best roller lawn mower will go a long way in easing your gardening experience. Whether you need a rear roller lawn mower for medium lawns or you need a larger one for a decent sized garden, we have got just the thing for you. We have come up with a list that considers size, preferable power source and expense to come up with the best lawn mower with roller list out there. We have also included a buying guide that will help you figure out what you need and what the complicated terminologies concerning the lawnmowers are when simplified. We hope it will enable you to come up with what the right lawnmower for your needs. If you are conversant with this type of mower, you can skip right ahead to our 'Best Pick' which is the Bosch Rotak 43 Mower which we think is probably going to be the best mower for most people. It's ideal for smaller and larger gardens, is electric for ease of use and best of all, incorporates a rear roller for creating them stripes we all envy. Consequently, we would recommend you go through the list so as to ensure you are going to be satisfied with your selection as we have a good selection of top recommended models. Features a rear roller for better stability and creating those lovely stripes. Hardened sharpened steel blade that gives an accurate cut of the grass with six cutting settings. With 1800w powerful motor, it has a high torque for optimum performance. It has a cutting width of 43cm that is suitable for small, medium and large lawns. It has LeafCollect technology that assists with the autumn leaves collecting. Has useful side combs which draw grass in from the edges, and ultimately giving a clear cut right up to the edges of lawns and paths. Our top 6 recommended lawnmower for creating a striped lawn. The Mountfield Princess 42 Electric Rear Roller Rotary Lawnmower has all the perks that come with an electric lawnmower. It is low maintenance and produces very little noise. The anti-scalp technology and mulch plug help to improve the quality of the grass. It also has safety mechanisms by having a motor brake mechanism. finally it creates really nice stripes and is suitable for small and medium sized lawns. A great mower from a brand we have come to trust. The type of roller mower is dependent on the size of the patch you will work on. A small lawn requires either a hand push or an electric mower. For a medium lawn, an electric or petrol powered lawn mower would be appropriate. If you however have a larger lawn, the efforts of having to trudge along a cable can be impracticable. You would rather go with a petrol driven or electric cordless mower. Cylinder mowers have a front rotary blade that scissors the grass. They tend to be more expensive but they work better for lawns that are frequently cut. They however struggle with longer and damp grass and work best on flat lawn as they tend to scalp uneven lawns. They have a roller on on the mower which creates the stripes but we found the cylinder cutting blade also creates a stripe. Rotary mowers are the most preferred model as they are great for lawns that are not perfectly flat. They have a rotating blade underneath and a roller on the back which creates the stripes on the lawn. Not all rotary mowers have a roller which is something to be a where of. We obviously only recommend mowers with a roller if you want a striped lawn. The Hayter Harrier-48 19-inch Self-Propelled Petrol Lawnmower is money well spent but is expensive compared to most other models. You not only get a durable long lasting lawnmower but you get one of the best lawn mowers for medium and larger lawns but also the perks that come with machines that is this advanced. From the corrosion proof aluminium deck to the cutter blade friction disc, it is easy to see how the Hayter Harrier-48 19-inch Self-Propelled Petrol Lawnmower is one of the most expensive models available and commonly used by professional gardeners, simply put it give the best results and will last for many years even when used daily by the most demanding gardeners doing to rounds. There are three types of lawn mowers in this relation. Manual push cylinder mower – with this, you do most of the work. This would mean it would be easier if it was used for a smaller lawn to avoid strenuous working. These mowers work well on flat lawns and create some of the best stripes and very affordable. Petrol mowers– these are the most powerful lawnmowers. They are flexible in use as they do not need a power cord making them suitable for larger lawns. They nonetheless tend to be extremely heavy and this would be a problem if they are manually driven. They also tend to be noisy and require yearly maintenance such as cleaning filters and checking oil etc. The starting method also matters since there is the key starting method and the pull cord method. The key method is however battery operated and needs to be charged or replaced with time. They are the best choice for larger gardens and electric start models are more expensive. Not all petrol models have a rear roller so check before you buy, we obviously on recommend the models with rear rollers on this review. Electric – a corded electric mower is lighter than a petrol one and is suitable for small and medium sized laws. They are low maintenance with a low noise pollution. They however are often not powerful enough for thicker growths of grass if your grass is left to grow long. The cordless one is more versatile as it reduces the thoughts accompanied by the strain and limitation of a power cable. The only flaw is that the battery can run out and might need replacing after some time and they take time to recharge, never the less, they are a great alternative to corded models. The presence of a collection box or bag for the grass should also be considered and really is a must, remember raking the grass would only ruin the stripes. The capacity of the collector also matters. The higher the capacity – which is measured in litres - the longer you can use the mower before you need to empty it. Also, some models come with a vision window to help you to see when the collector is full which is a great feature. You can also invest in a lawnmower with a mulching capability. These ones cut up the grass and push them into the turf. They end up decomposing and will eventually improve the quality of the grass on your lawn. Again this feature is probably not the best idea for someone looking to creates stripes. Most lawnmowers have different adjustable heights for how high the grass will be after cut depending on your preferences. The blades are easily moved up and down. Some mowers have a greater varying ranges while others have smaller ones. Knowing how short or tall you want your grass to be is very crucial. The longer the blade of the mower, the more grass that gets cut with each pass. This is usually crucial with larger sized patches as it reduces the amount of time spent taking care of the lawn. Small gardens suffice with a 30cm cutting width. Medium sized lawns with a 35-40 cm width and a large gardens should look for a 40cm+ width. These are an added advantage when it comes to lawnmowers. They help in trimming the lawn right to the edge to prevent you from having a separate trimmer. Not all models have this feature and they are usually fitted to rotary mowers. Again this is a nice feature to have but not essential. The weight of the lawn mower also matters as it determines the effort needed to push the lawn mower as well as carry, specially if you have steps to carry it up and down or are a professional gardeners going from job to job. Unless the mower is self-propelled, it is crucial to know how much weight you can comfortably push around. Self-propelled lawn mowers are those that propel themselves forward with the push of a button and they need little assistance. The speed is roughly equivalent to the speed of walking. Most lawnmowers are fairly light weight, specially manual and electric mowers and even most petrol models are not to heavy for most people. Now you know what to look for in a good lawnmower for making stripes we will go deeper and look into the best lawn mowers and review each model in more detail. Bosch once again has produced quality machines with the Bosch Rotak 43 Ergoflex Electric Rotary Lawn Mower is a very impressive lawnmower that is ideal for both medium and larger sized lawns. The physical design of the mower is appealing to the eye and it has some great features to match. It has a powerful 1800w power-drive motor with a hardened sharpened steel blade that gives an accurate cut and the rear roller gives your lawn an immaculate striped finish. 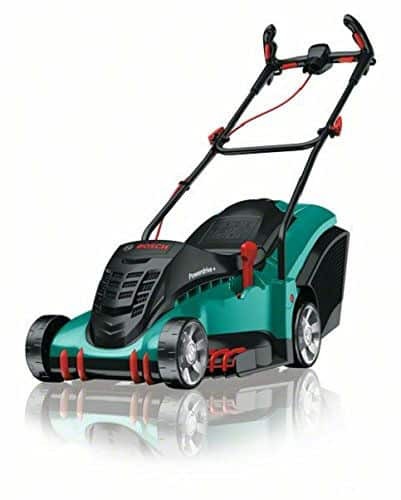 It has a high torque that helps in all conditions whether the grass is dry or wet which means it even cuts well in wet grass when most other models would struggle. Bosch claim the power-drive technology in the motor gives it a 99% grass collector which basically means it collect pretty much all the grass it cuts. As with most electric lawnmowers, it is a lightweight model with a weight of 12.7kg and has an impressive cutting width of 43cm which does indeed make it appropriate for larger lawns. Consequently, it has adjustable cutting heights of 20–70mm with these being distributed in 6 different settings so you get the perfect height. It gives a traditional edge trimming and with the new leaf collect technology that assist with the collection of autumn leaves which is another nice feature, simply blow all the leaves together with a leaf blower and pick them up with the mower. The capacity of the grass box collector is 50 litres which is a decent size which means you can spend more time mowing and less to emptying. What is fascinating about this model is the ergonomic design that prevents you from straining you back muscles and such. The handles are made for easy holding and pushing the mower. The handles are also double handed controls meaning it can be controlled by the right or left hand. They also fold up easily for storage purposes. There is a QuickClick system that enables you with the quick assembly of the lawnmower. 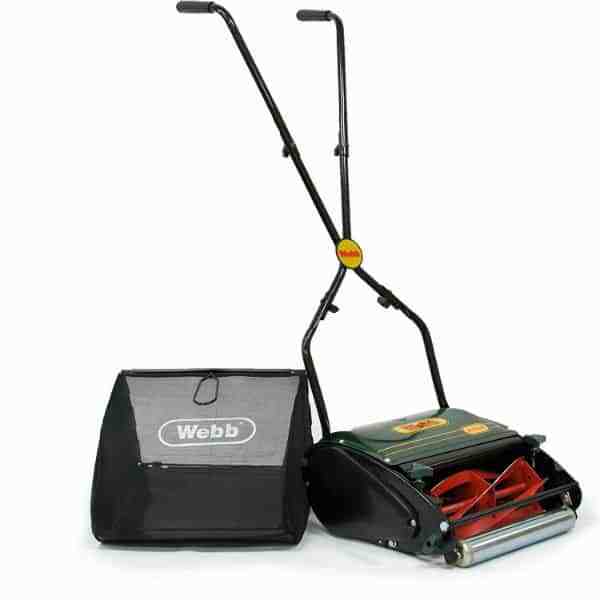 It has an innovative airflow technology that assists in the cutting of the grass properly. The useful side combs draw grass in from the edges which allows you to mower right up to the edge of the lawn or against fences, walls etc and still cut every blade of grass. It however tends to be slightly noisy which is to be expected with most larger electric mowers. It comes with a 2 year guarantee free of charge and an additional two to three years if the lawnmower is registered with Bosch within 28 days of the purchase of the machine. Wide 43cm cutting width and rear roller for creating those distinctive stripes. Features power-drive motor technology, which gives it a high torque and accuracy in not only grass cutting but in the grass collection. The ergonomic design that is unique to this model reduces muscle strain. Quick to assemble due to the QuickClick technology used in the model. The featured innovative airflow technology. The featured leaf collect technology makes it constantly useful even in the autumn season, while the useful side combs help with drawing the grass from the edges. It has double handed controls that help it when in use in both the left and right. The power cord could do with be longer, those with larger gardens might need to invest in a extension cable but we sure you be a good one and to never leave it rolled up when in use. The Bosch Rotak 43 Ergoflex is perfect for medium and large lawns and is probably the best choice for anyone looking for an electric lawnmower which has a rear roller fitted. The lawnmower has a wide cutting width which would be advantageous to those who like mowing in little time. The adjustable handles and cutting height makes this model adaptable to people with different height requirements. You would appreciate the way it is easy to use and quick to start by a simple electric start. Also, the fact that it is lightweight and you can mow the entire lawn effortlessly in a matter of minutes and is easy to carry up and down steps. Even more, the prolonged grass combs on the Ergoflex 43 mows up to the edges providing an extra trimming absolutely superfluous and does give a good finish and means less time trimming the edges. All things considered the mower is well built and it is equipped with modern technologies that encourage unbeatable performance. Overall this is a great choice for anyone looking for an electric model for medium or larger lawns, but don't won't to use a petrol mower and need a model that will create those stripes and give a fantastic finish. It really is a super mower and worth every penny. If this model is a little too big then our new mower below may be a great alternative. The Mountfield Princess 42 Electric Rear Roller Rotary Lawnmower is a three in one mower that cuts, collects and mulches the grass clippings for you giving you multi options. Its dimensions are 28 X 22 X 21 inches. so is fairly compact thats to its fully folding handles that usually comes in handy in instances where storage space is critical. The wide rubber tyre wheels are efficient in ensuring that the lawnmower moves smoothly. Aside from the wheels and blades, the body of this model is made of strong plastic which prevents rusting and ensures its light weight. The underside of the cutting deck is specially designed to prevent scalping. Scalping is when the lawn is cut way too low and this destroys the scene and quality of the lawn. This anti-scalp technology ensures your lawn remains neat and well taken care of. This in conjunction with the grass combs provide and improve a cutting finish and enhance the collection of the grass clippings. As it comes with the rear roller, it provides a striped effect which really do stand out but you have to have it on the lower setting. With the option of lower cutting heights, you can easily cut the grass to the lowest recommended heights. The rear roller also ensures that the mower can easily work on the edge of the lawn. The back of the mower also has a grass flap for the collection of the clippings and a vision window to see when the collector is full which is a nice feature. The capacity of the collector is 50 litres so can collect the same amount as our best pick but is ever so slightly thinner. The rear discharge also can rid you of the grass clippings or insert the mulch plug that will infuse the clippings into the soil to decompose and assist in the richness of the soil. Ideally you probably just want to collect the cutting if your looking to create stripes though. Being electric, it has a powerful 1800w motor for great cutting performance. As with most modern lawnmowers, it has six cutting positions ranging from 25 – 75mm and a cutting width of 42cm. Being a corded electric mower, the mower has a long 15m cable giving you ample space and freedom while it is in use. It is also quite light with a weight of 14kg. Finally it does come with 12 months warranty which we actually think should really be at least 2 years. Powerful 1800w motor and wide 42cm cutting width with larger 50 litre collection box. Fully folding handles make it easier to adjust to comfort and store the lawnmower away. The anti-scalp technology found in the cutting deck ensures even the lowest cutting height will not ruin the grass. The removable mulch plug not only reduces the amount of time spent taking care of the lawn but also improves the quality of the lawn due to the fertility increase. The rotary blade gives the lawn a striped classic finish giving the lawn an elegant look of it all. It contains a grass collector and vision window makes things easier to look when the grass collector is full. Warranty of only 1 year is not as good as most other models some of which come with 3 years warranty. We think that the Mountfield Princess 42 Electric Rear Roller Rotary Lawnmower is quite a good mower and certainly a great alternative to our 'Best Pick'. It has sufficient safety control and the extra rotary features make it a mower that you would like to have in your lawn. It would please whatever gardener who owns it. Moreover, the anti-scalp technology is quite a big plus for anyway who regular scalps the lawn. If you have a relatively medium lawn, the Princess 42 electric lawnmower is what to rely on. The mower allows you to cut 6 different heights and you’ll appreciate the lever that lets you choose a height of your preference with ease. All in all, this machine is well built apart from maybe the plastic parts which render it vulnerable to wear and tear but no worst than most other models. Does a great job at creating those stripes to. The Webb H12R Push Hand Cylinder Lawnmower is a five bladed mower with a 300mm (12") cutting width with Rear Roller for creating stripes. These blades are the ones that assist in the differentiation and adjustments of cutting heights. It's cutting height ranges between 13mm for a low cut, much more defined and 23.5mm. The height can be changed very easily, no tools needed. Being a cylinder land mower, it has hardened steel cylinder cutting mechanism that ensures efficiency and speed in cutting of the grass. It comes with a felt mesh basket for grass clippings collection. This assists in lessening the job since there is no raking of the grass clippings afterwards. All you have to do is empty the bag once it is full. Being a hand push, it is virtually noiseless and its operation is relatively enjoyable. The large rear roller provides an attractive striped finish. It unfortunately does not have a large collection capacity and the 18 litres are simply quite adequate. The lightweight machine is 11.1kg making it one of the lightest models in our review. What we find very relieving about this model is the 3 section handle that makes it easier to use comfortably. The classic British Racing Green Livery machine has a one year warranty for domestic use and is quite easy to assemble. Ideal for smaller lawns that are flat and creates perfect manicured stripes. The hardened steel cylinder mechanism gives speed and efficiency alongside durability when using the mower. Its plant protection plate and collection bag make things easier when it comes to collection of the grass chippings. The 30cm cutting width gives you an opportunity to cover more ground during operations. In addition, it has different cutting heights to choose from. The mesh bag is not the best quality and care must be taken not to damage it. It does not cope well with extremely tall or wet grass. Not suitable for uneven lawns. Those in search for a light weight unit with the effect of a heavy roller can set their eyes on this model. As a bonus it is a push hand mower so the gym is closer to home than you realise. Generally, all features considered, this model is the best among the hand push mowers. Its adequate cutting width and the 18L collector are impressive for such a machine. 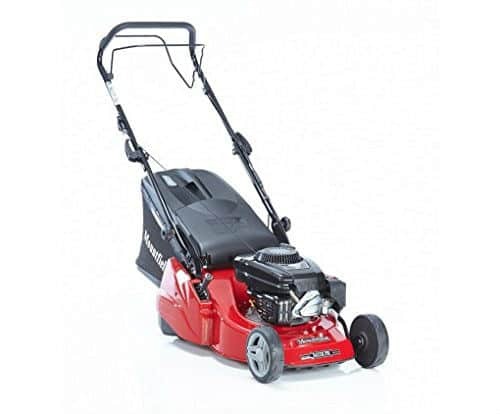 Purchasing this lawnmower for a small lawn will be the best choice for your lawn and it is affordable and you have now power cords to worry about or petrol engines to maintain. The only real problem with this mower is that the lawn has to be flat and its only really suitable for small lawns, Overall we feel its under-rated and any problems are usually down to the user not using it as intended such as on a uneven lawn. The Hayter Harrier-48 19-inch Self Propelled Petrol Lawnmower is a modern definition of the very best lawnmowers. 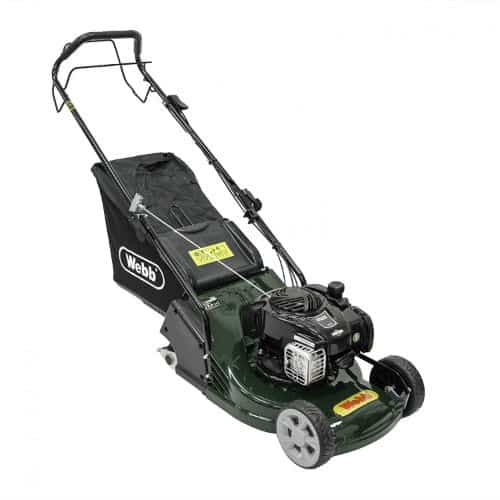 The high powered petrol mower has an impressive cutting width of 48cm (19"), it covers a large surface of grass in one cutting making it fast in its use which makes it perfect for large gardens. Other features which make this model stand out is the fact that it is self-propelled with an electric start up key whose battery and charger come separately, this means no pull cords to contend with. It also has a variable speed giving you a choice on how fast you want to go. If you are looking for rear roller lawn mowers for medium and large lawns, this is one of them and probably the best mower in our review. The cutting height is adjustable from 13-60mm which can be set using a simple counter balanced lever so you have a good choice of cutting heights. It has a unique cutter blade friction disc for the best cutting performance. It boasts of a lifetime guarantee on the crankshaft bending and comes with a 3 years manufacturer’s warranty on the mower itself including the engine. Unlike most cheaper models the body is made up of robust high aluminium to prevent damage and designed to cope with the day to day work of a professional gardener mowing everyday. It has a large 70 litre grass bag that is not compulsory to use when activating the rear discharge feature. The fabric grass bag is fixed through the handlebar for ease and simplicity. It is also easy to remove and empty when full. The easy height adjustment feature in the handle makes it easy to be used by various heights of people. The handlebars are also fully folding. The two piece ribbed rear roller has differential support for superior traction, easy turning and the ability to act over the lawn edge. The aluminium deck provides corrosion resistance, high durability, long life and easy mowing around the borders. The Briggs and Stratton engine enhances power and performance and the tough ABS underdeck liner supplies enhanced cut and collection while being easy to clean. It also helps with the quiet operation of the model helping to reduce noise. One of the stand out features of this model us the variable self propelled speed which can be set between 1.5 and 3mph which means you can set the best speed for your walking pace of slow the speed down for longer wet grass and speed up for shorter dry grass. As mentioned the electric start it also a great feature for quick startups and no pull cords to contend with. Wide 19 inch cutting width with 7 cutting heights, perfect for the largest of lawns. Large 70 litre collect bag to ensure more time mowing and less time emptying. Self-propulsion and variable speed make it easy and comfortable to work with and adapt to the conditions. The cutter blade friction disc prevents engine crankshaft damage. The ribbed rear roller give it superior traction and control over the mower when you need to turn it. The aluminium deck provides corrosion resistance features in combination with durability and strength. Start up is by an easy electric key which means no pulling stiff cords. Lifetime guarantee on the crankshaft and 3 years warranty on the mower. No problems to report, a near perfect mower just a little heavy but is expected for such a good high quality mower. 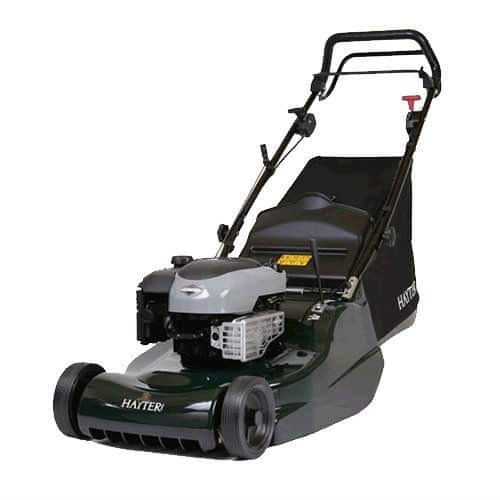 We think that the Hayter Harrier-48 Self Propelled Electric Start Petrol Lawnmower is hands down the best lawn mower for maintaining a large garden and is simply faultless and packed with features. It boasts the latest advanced technology and seeks to improve customer comfortability while improving the cutting performance. It is equipped with such tools and features that it is clearly worth its price when compared to average alternative mowers. We like the fact that it is easy to start with just a button to give us an easy start in mowing. With its variable ground speed, 7 cutting heights and a rear roller than produces probably the best stripes you will ever see, this model is worth every penny to professional gardeners looking for a workhorse or home gardeners looking for the very best mower. It may be expensive but it will not disappoint and comes with a 3 year warranty for full peace of mind. Most other petrol models only come with 1 year so 3 years is excellent. If you're looking for a petrol alternative that is more affordable, our next two mowers below could be a great alternative. As usual with most rear rollers for lawns, the Webb 17"(42cm) Petrol Lawn mower with its rear roller gives you a classic striped finish with an easy starting Briggs and Stratton 500e engine that gives you a high performance and cutting experience with its powerful 1400cc easy start engine. It's kind of surprisingly lightweight for a petrol mower with a rear roller at 32kgs but its still very easy to manoeuver. It has folding handles that come in handy when storage space is minimal. It has six cutting heights that range from 23-77mm with a wide 17 inch cutting width making it perfect for larger lawns. All this is controlled by a single lever making it very easy to change the cutting height from a single move of the lever The ABS thermoplastic deck comes in handy with the efficiency of the model. The capacity of the collect box is 55 litres so plenty of room for longer runs. This comes also with a mulch plug that helps in the recycling of the grass clippings. The self-propelled model has padded handlebars that add to the comfort and ease of the little control needed over the mower. It comes with a 2 year manufacturer warranty and is easy to assemble taking less than 10 minutes since the instruction manual was a picture assembly method which is very easy to understand. This model also assists with a common problem found in most lawn mowers. The long wheelbase prevents then annoying tramlines. As expected for safety purposes, there is an engine stop brake bar, as soon as you let go of the handle it stops. It requires 450mm pf engine oil that is not included with the package and has to be bought separately so be sure you add this to your order when ordering your mower. 17" cutting width with 6 cutting height of 23-77mm and a more affordable option for home users. It's self-propelled with an operator presence control that makes it easier to use and control. Fitted with a trusted Briggs and Stratton engine in this model is easy to start and to maintain. ABS Thermoplastic deck which is robust and designed to last. It has a mulch plug for recycling the cut grass clippings. The Webb 17" Petrol Lawn mower is a state-of-the-art lawnmower that comes at a very good price, specially when compared to the Hayter Harrier Petrol Lawnmower but the model by Hayter is in a different league. It is one of the many if not the best rear roller lawnmower for medium lawns. It comes fully equipped for that modern gardener who wants a self-propelled operator presence control and whatever other high gismos it contains. It gives you an easier and more effortless time management. This model starts easily and runs smoothly thanks to the engine Webb have fitted. The outstanding engine makes it more efficient and comfortable during operations. The adjustable cutting height of 23-77mm is an added advantage for those looking for optimum performance. However, the difficulty in assembling the machine is a disappointment as it discourages the use of this machine. We would appreciate spend more time on mowing than on assembling the machine, however once assembled its a great machine. To sum it up, this model is perfect for those looking for a more affordable mower with all the great features and more importantly, great performance and the stripes it makes on the lawn. A super machine for any home user. If your looking for an even more affordable alternative our last mower in this review may be worth considering but its best for smaller lawns. Check it out below. The Mountfield S421R PD 41cm Mower is a machine that uses revolving blades to cut grass to an even height. This machine is self-propelled best for perfect lawn stripes. Normally, you can adjust the height of the cut grass but sometimes it may be fixed by the mower. This mower is powered by a stress-free start 100cc Mountfield RS 100 OHV 4-stroke engine so its reliable. It cuts right up to the paths and the edges with the forward drive from the powered rear roller. It has a strong, powder dusted steel chassis to ensure the mower will deliver an outstanding finish for a long time. there are 5 cutting heights, which are selected by the single lever and easy to change, starting from 2cm to 7cm, this is to ensure you have a variety to choose from to suit your desired finish. This mower is appropriate for smaller sized lawns of about 20m x 20m because of the 41cm (16') cutting width. The rear roller is an added advantage that produces a standard stripped effect we all want. In addition, there is a 55 litre collector that is easy to attach and has an indicator to show when emptying is necessary which is a nice little touch to the design. It is a self-propelled rotary rear roller that provides the classic striped lawn finish and reduces the exertion used when pushing the lawnmower. It cuts up right to the edge of the paths and border edges that makes it efficient. The collapsible handles make it easy to use and store. Has an operator presence control, which makes it easy to interact with the lawnmower. The 5 heights of cut ensure you get your desired finish height. The indicator on the 55L collector makes it easier for you to know when to refill and empty. It is covered by an impressive 5-year warranty which is more than enough time to give it a good testing. Only really suitable for smaller gardens. The Self Propelled Mountfield S421R PD Lawnmower is the best lawn mower for stripes if you have a small lawn. You will appreciate the strong RS100 OHV engine that should be very reliable. Moreover, the chassis steel is smeared with powder enhancing its robustness. Finally, we recommend this model for any good gardener who wishes to shape and nicely stripe thier lawn. It is the best for domestic use but could be handy for smaller commercial use for gardeners maintaining smaller gardens where there larger mowers may be to big, finally the five-year warranty is an amazing advantage and gives full peace of mind. 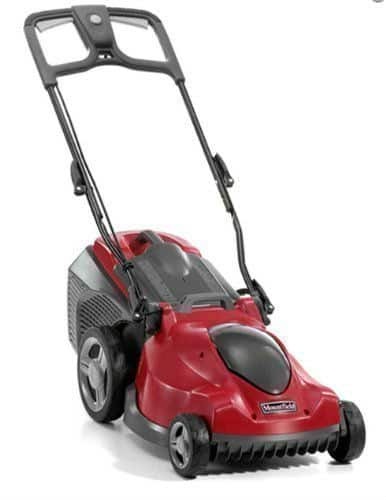 Overall a great mower thats also very affordable. An English garden is one that typically has a classically striped lawn. This is achieved as we have seen above using a lawnmower with a rear roller. However, more often than not it can get confusing knowing what length of grass you want to cut and to what height, the type pf power you want to use and other little benefits that come with various models. We have come up with the above list to hope that you at least have an easier time going through the different types of lawnmowers in the market, coming up with a checklist of the must haves and ensuring you get one that sticks and solves your needs. So whether you want a rotary blade or a cylinder lawnmower, we have found the best roller lawn mower to suit the variables such as size in order to accommodate all walks of life and highlighted the most important bits. Below is a quick summary of some of the best lawn mower for stripes. After a serious scrutiny on the six aforementioned lawnmowers, we settled on the Bosch Ergoflex 43 as the best rear roller lawn mowers for smaller and medium sized lawns for those who are looking for an electric model for pure ease of use and virtually no maintenance. This model happens to have the highest number of encouraging reviews contrary to the other five so this also confirms our own finding. The mower has the widest cutting width and the fact that it gives a perfect trim to the edges of your lawn is outstanding. Besides, you get to mow your large lawn in few strips because the machine covers a wide width. Furthermore, the model is lightweight, simple, quick to start and easy to use. You can acquire a good mowing experience by using this machine. It has a powerful 1800w motor for an effortless mowing practice. Therefore you can proudly rely on it not to struggle, even when mowing longer grass. If you are among the few individuals who enjoy work and at the same time get admirable results, then Bosch Ergoflex 43 is the machine you require to achieve your mowing goals. Plus the price is worth the machine and it creates those fantastic stripes we all want. The Webb H12R Push Hand Cylinder Lawnmower with its hardened steel cylinder cutting mechanisms and five blades fits the bill here. It is fairly cheap (not to cheap though) and durable. You do get what you have paid for as it mostly has the simple basics needed for a lawnmower. Some of its features are not sturdily made such as the collector basket. However, it is still a pretty good model to use for those people who have a tight budget. The only thing to be a where of is your lawn needs to be flat and not to large.